UB40 are a British dub / reggae pop music band formed in 1978 in Birmingham, England. The band is one of the most culturally diverse dub reggae bands with musicians of English, Scottish, Irish, Yemeni and Jamaican parentage. The band is named from the paper form issued by the UK government's Department of Health and Social Security at the time of the band's formation for claiming unemployment benefit (UB40 = Unemployment Benefit, Form 40). UB40 are a British dub / reggae pop music band formed in 1978 in Birmingham, England. The band is one of the most culturally diverse dub reggae bands with musicians of English, Scottish, Irish, Yemeni and Jamaican parentage. The band is named from the paper form issued by the UK government's Department of Health and Social Security at the time of the band's formation for claiming unemployment benefit (UB40 = Unemployment Benefit, Form 40). UB40 were influenced by the many Blues Parties they attended as teenagers in the multiracial Balsall Heath area of Birmingham, their love of ska and reggae inspired such original tracks as King, Madam Medusa, Food For Thought, Signing Off and One In Ten. Their early music style was unique, with a heavy influence of analogue synthesizers, psychedelic rock guitar, saxophone and dub producer techniques which were later perfected by the late Pablo Falconer. The band purchased its first instruments with compensation money Ali Campbell received after a bar fight. They have had a number of hits, most commercially and to amusement of the band, "Red Red Wine", a cover version of a Neil Diamond song (in an arrangement similar to that of Tony Tribe's version). Their most successful single release is the cover of the Elvis Presley ballad Can't help falling in love which was intended to be the main title to the 1992 Sharon Stone movie Sliver and was a Number One hit across Europe and in the U.S. Many of UB40's recordings were inspired by 1960s ska and early lovers rock songs that would have otherwise been forgotten in the public eye. Their new injection of life into so many old Jamaican hits has resulted in many musicians' and producers' renewed popularity and income. 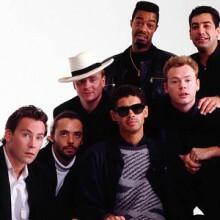 UB40's early music often tackled social issues such as racism and unemployment. Other artists that UB40 have collaborated with include: Pato Banton, Madness, Bitty McLean, Chrissie Hynde, Robert Palmer, Hunterz, Japanese artist Mikidozan, French artist Nuttea, Lady Saw and Afrika Bambaataa. Darling readers if you are reading this, you are on on the page of the recording artist ub40 in our eLyricsWorld. Our database comprises with data about 52389 artists worldwide as well as 829824 songs 360 of which are from ub40. Besides the singer's biography, on this page you can see brief information about them, enlists birthdate, genre, label Be conversant with all the facts around ub40 by adding RSS feed. If you prefer you could directly visit the address you are on at the moment and check out what's new and latest songs about the artist.